Drake / "Nice For What"
Drake dropped "Nice For What" yesterday and just gave us another joint to turn up to this summer. If you weren't sold by the star-studded cast in the video (which included the likes of Issa Rae, Yara Shahidi, and Letitia Wright), or the empowering lyrics, then at least by the infectious New Orleans bounce style production. The song, which featured a sample from Lauryn Hill's legendary "Ex Factor," was produced by Murda Beatz and featured co-production from New Orleans bounce veteran BlaqNmilD. Blaq is no stranger to the N.O. bounce sound, hailing from the city and even being signed to NOLA hip-hop hero Master P's NoLimit Forever label. He's even produced for bounce legend Big Freedia. FADER spoke to BlaqNmilD about producing on "Nice For What" and what it means for New Orleans. Read his statement below. BlaqNmilD: The song had production already by Murda [Beatz] and was already an instant hit before I touched it just because it was Drake being Drake, plus Lauryn Hill's sample just running through out the entire song. Drake & 40 felt like they needed a turn up in the record so my homie 5th Ward Weebie (who's a pioneer and New Orleans bounce legend formerly signed with No Limit Records) was called and asked which producer from our city [New Orleans] that do bounce beats was best for the job. I guess by our history and the fact that we recently had a hot record called "Let Me Find Out" featuring Snoop Dogg & Juvenile, to him I was the guy for the job. But also because I'm an all around type of producer. I was in the area already when I got the call, Weebie and I went to Drake's crib, chopped it up, and we were told not to hold back and give that raw New Orleans bounce feel to the record. 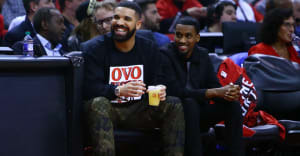 Once I seen a smirk from Drake's face as he heard his vocals chopped up over that bounce beat, I told myself, "I think I got'em," and 40 was so excited about it, I knew it was official. In so many ways this record is gonna have an impact on my city, not just because of the bounce feel I've composed to it, but because of how it embraces the women and the positivity. Also, the picture that the video paints takes it to another level and that's incredible to me because it shows that even through bounce we can send positive messages. This record should motivate New Orleans artists and producers to try to bring this game back to the bottom of the map like Cash Money and No Limit did in the late 90s. This bounce sound is ours an we take it serious when an outsider touches it and don't do it right. We all are excited about the situation. I Salute Drake and the OVO team for this one.